This post was sent to me by the original Energized Tech and former Friday Funny Guy. Sean Kearney is not only a Microsoft MVP (PowerShell), he is a good friend and certainly among the most passionate technology enthusiasts and Microsoft fans I have ever had the pleasure of knowing. Sean will be assisting me at the official opening of the first international Microsoft Store in the Yorkdale Mall (Toronto) on November 16th. 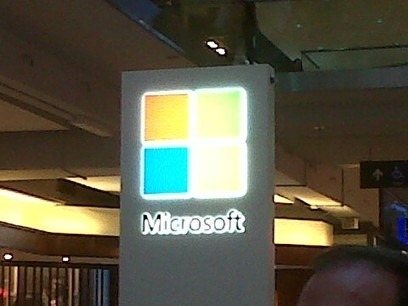 Microsoft Rises Above With Microsoft Surface and Windows RT. So what was the morning like? On October 26th I had a crazy day. The Microsoft Surface PC was being released, and I NEEDED and WANTED one for a presentation I was doing that week. Hopping on the first train from my home to the Eaton Centre in Toronto, I rushed to find the Kiosk. Oh and I did, the logo stood out calling to me…. “Sean! Run here!” Run I did thinking there would be a limited supply. I was all prepped up in my nerdiest of gear! MVP Scarf at the ready! But Microsoft ensured stock was APLENTY. “32GigabyteWithAKeyboardIfYouPleaseButIfYou-Don’tThat’sOkCuzIJustNeedOne” the words burst out of my mouth in a rapid blast of syllables. I stood in line and looked. With about two hours to go, a line was building. A hundred strong and growing by the minute. It was a line full of executives, enthusiasts and even a few Mac users! I was blown away! I was shaking like a leaf. There was some hooting and hollering along the way and oddly enough there were wagons full of candy bars. But I wouldn’t move a micrometre from the line. I wanted my Surface and would not allow my own grumbly stomach to delay that. We nerds have our priorities don’t ya know (MDG Note: Although Sean was born in the USA, this is a very common down-to-earth Canadianism, often heard in Saskatchewan and Nova Scotia). After about FORTY minutes I found myself staring at the counter moments away from the Surface. Live production models were on display, sexily toying with my emotions. But in a very short while I would be standing in front of the Register, a dream being realized; I would own a real Microsoft tablet PC. One 32gb Microsoft Surface with keyboard combo and a VGA extension to run off projectors. “I own a Microsoft Surface.” The words barely left my lips moments before a large “W0000000TTT!!! !” shattered the air. I think some of the staff in the kiosk fell back from the shockwave. There was applause over that. The Microsoft people seemed to enjoy getting a bit of praise. It’s nice to feel a job well done. I hold it in my hands now and realize I am holding something truly different. It is a device that is as portable as a current tablet device and yet just a bit more. It’s Windows 8 computer that is slim, powerful and capable of running my presentations, allowing me to blog and have a little fun at once. But best of all, a system with the same user experience as my full-fledged desktop version of Windows 8. I can finally have a portable device that works the SAME as my desktop with very few differences. I can attach data from my BitLocker-encrypted USB memory kit, pull files of my MicroSD, and print if needed. I can leverage the power of Microsoft Word, PowerPoint and Excel because they are built right in! I can (and am doing so at this very moment) attach a full sized display and USB keyboard/mouse to my Surface and use it just as if it were a real PC. Because when you get right down to it? That’s just what it is. and I personally LOVE IT!